When the current F-150 debuted in 2003, it seized the Truck of the Year award, and turned the fill-size truck segment on its ear. With sophisticated looks, stylish interior, and competitive lineup of powertrains, the F-150 made everything else on the market look obsolete. However, it is four years later, and all of the competitors have released their new trucks in the interim – all aiming to match or beat the F150. The truck is still the king of sales, but the age is showing; especially in the powertrains, where the Ford’s 300hp V8 mated to a four-speed automatic transmission cannot match the 400-some horsepower engines mated to six-speed transmissions offered by the competitors. So, despite rising gas prices and a housing market collapse, it is the right time for Ford to release a new generation of the F-150. A lot has been written about the new truck, but unfortunately, the most prominent piece, written by Edmunds, was the one that had the most mistakes in it. So let me take this opportunity to present the full and correct outlook for the upcoming truck. The exterior styling will borrow heavily from the Super Chief concept revealed at the Detroit show in 2006 – sporting a bold, brassy, in-your-face front. If the huge nose is not imposing enough, the cabin was made taller by about three inches, making the truck appear significantly bigger than the current model and most of the competition. Speaking of the cabin, Ford will respond to the trend started by Dodge and offer a new larger “Super Cab.” The truck will also incorporate many of the innovative features released with the 2008 Super Duty, such as tailgate step, or integrated trailer brake, and add some more, such as fold-away steps right behind the cab to ease access to the front of the bed. The interior will follow the design theme started with the current F-150 and continued with the 2007 expedition and 2008 Super Duty. However, the 2009 F-150 will abandon Ford’s current switchgear and the “brick” stereo head unit, and use a version of the switchgear from the 2008 Escape, including top-dash display. On the powertrain side, there is one big disappointment – there will be no BOSS V8 engines at launch; all the V8 engines at launch will be from the Modular / Triton family. However, new engines will be added quickly though the 2009 model year and at the beginning of the 2010 model year. The big news in powertrains is the elimination of the four-speed automatic transmission and adoption of six-speed automatics all across the lineup. This move will leapfrog the like of GM and Toyota who offer such transmissions on only the most powerful and expensive models. The base engine will be an all new 3.7 liter V6. This is a version of the D35 engine rapidly spreading through Ford’s lineup, and while there will be other 3.7l V6’s in Lincoln’s and Mazda’s lineup, the V6 in F150 will be unique, specifically tuned for low engine torque. While the numbers are not revealed yet, expect about 260 horsepower and 280 or more ft.lbs of torque at about 2000 RPMs. Next up will be the venerable three-valve 4.6l V8 from the Explorer. This engine will be not modified in any way from its Explorer application so the power numbers will remain 292hp, and 300ft.lbs of torque. This engine is at its final years of production, and will be dropped shortly after the engine lineup is completed in the 2010 model year. The third V8 at launch will be a new version of the 5.4l V8. Mostly using the Expedition setup, Ford has reworked the engine for more power, torque, refinement, and efficiency. The final numbers were not revealed yet, but 325hp and 380ft/lbs of toque is a reasonable expectation. The first post-launch change in the powertrain lineup will occur in the first weeks of 2009. As a Job2 change, Ford will add a 6.2l V8 engine. This will be the first member of the BOSS family, and while the engine is still in testing, it is expected to be rated at around 425hp. This engine will be officially revealed and released a couple months prior in the 2009 Lincoln Navigator. Final major change in the engine lineup will come with the launch of the 2010 model year of the truck in the summer of 2009. A new 4.4l V8 diesel engine and a 3.5l V6 will be added, and, as mentioned above, the 4.6l V8 will probably be dropped. The diesel is a larger version of the 3.6l Lion V8 diesel Ford developed with France’s Peugeot/Citroen (PSA) automaker, and will deliver around 315hp and 520ft.lbs of torque. The Twin Force engine will be positioned as a V8 alternative with better fuel economy. Using twin turbochargers, direct injection, and twin independent camshaft timing, the engine will deliver about 400hp and 400ft.lbs of torque at 1500rpms. It is unfortunate Ford will not launch the truck with the full engine lineup, and it will likely hurt the sales some; but with the rapid rollout of the remaining engines the damage should be minor. Moreover, Ford has a final ace up its sleeve; in the 2011 or 2012 model year, Ford will add a monster of an engine: a version of the 6.2l V8 – delivering more than 650ft.lbs of torque and around 500hp. The new engine will deliver performance equal to, say, a Chrysler SRT-10, but with a smaller engine and better fuel efficiency. Like with the 2008 Super Duty, Ford is not playing around with the truck and aiming squarely for the “class leading” designation. We will see the truck at Detroit Auto show in January, and Job1 is on August 8th, 2008. Completely awesome!!!! I would love to see those design elements in the new F-150. 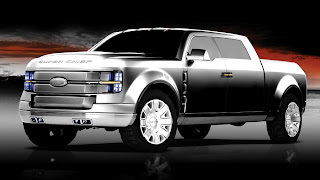 Can you imagine just how great the the F-250 and the F-350 would look with that treatment? I would bet the F-250 SuperDuty is going to look like one bad mutha with that new front end and a bigger cab. If it looks like the concept, all it says to me is “new Sub_Zero refrigerator”. I know the inspiration for the concept was supposed to be the chrome streamliner locomotive, but, it’s not doing it for me. I think it will be like when the Chrysler 300 came out, you’ll either love or hate it, nothing in between. I don’t know how I feel about the concept. I think this will be one of these vehciles you’ll have to see in person before you can make up your mind. Is this real or parody? What a ridiculous cartoon of a truck. Do truck buyers actually have taste that adolescent and unsophisticated? Well, this is America, so the answer is probably yes. Would really like to see some interior shots. I saw the stacked headlight design on the current GM fullsize trucks as a cue from the mid-80s Silverado front ends. Ford has never used a stacked headlight design, although the current Super Dutys have that updated headlight assembly that’s kind of stacked over the turn signal, so I wonder if a version of the Super Chief Concept’s headlight design will become reality. Maybe the re-designed Fusion’s front end styling is more of a clue to the future than I thought – the newest Fusion’s headlights and turn signals are a staggered/stacked arrangement. Hopefully, the next F-150’s fold-away step arrangement really will help access to the front end of the bed. The 2007’s bed rail height sure is on the high side. Just one more thought on the stacked headlight thing: The Ranchero had them, and I do think they look good on the Super Chief Concept. It looks steroidal, but I’m sure the truck faithful will love it. BIG AND BEAUTIFUL AS FAR AS I’M CONCERNED! It’s a shame the new engines will not be available at launch. Really looking forward to the new twin-turbo. As an owner of a 2006 F-150, all I can say is if they don’t FIX THE SEATS, my next new truck will be a GM or Toyota product. An inch or two of rock hard foam over a steel pan just doesn’t cut it. wow i wana see that 6.2l boss to bad it wont be there at launch but soon there after is fine with me and thin the 6.2 twinforce v8 wow…this is what the f150 and ford in general is in need of……cant wait.